Mary Bottari wins March Sidney for “Behind Janus: Documents Reveal Decade-Long Plot to Kill Public Sector Unions,” published by In These Times. The Supreme Court is currently deliberating Janus v. AFSCME, a case that could decimate public sector unions and the Democratic Party. The lead plaintiff, Mark Janus, is an Illinois child-support worker who ostensibly doesn’t want to pay union fees, but the money and strategy behind the lawsuit came from a network of billionaire-funded right wing think tanks. The Supreme Court decided 40 years ago that unions can collect “fair share fees” from non-members to cover the cost of bargaining, but not political activity. The Janus plaintiffs want to kill fair share fees for public sector unions on the grounds that all money is speech in a post-Citizens United world. 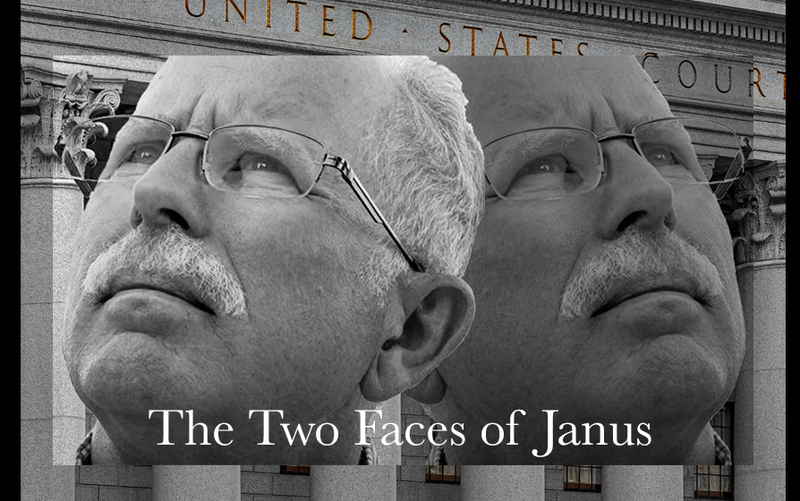 Bottari traces the roots of the Janus case to a sophisticated, lavishly-funded, nationwide campaign funded by billionaires including Illinois Governor Bruce Rauner and the Koch Brothers. The Bradley Foundation has spent over $135 million to defund labor, and the Donors Trust/Donors Capital Fund has spent over $70 million. The cash flows to what some scholars call the Troika: The American Legislative Exchange Council (ALEC), the State Policy Network (SPN), and the Koch’s Americans for Prosperity. ALEC writes model bills for state legislators, SPN think tanks provide intellectual cover and legal briefs, and Americans for Prosperity provides the illusion of grassroots support. The end result is right to work legislation in red states and lawsuits like Janus in blue states. “The attack on public-sector workers is also an attack on women and African Americans, groups disproportionately represented in public-sector unions,” Bottari writes. Many of the leading backers of privatized education are simultaneously financing the assault on teachers’ unions. “The recent successful teachers’ strike in West Virginia demonstrates the public sector workers are prepared to fight for their jobs and the people they serve,” said Sidney judge Lindsay Beyerstein. “If the U.S. Supreme Court rules in favor of the anti-union groups overturning 40 years of precedent and thousands of contracts for millions of workers, we are likely to see a lot more West Virginias,” Bottari said in our Backstory Interview. Mary Bottari is a senior reporter for the Center for Media and Democracy (CMD) in Madison, Wisconsin. She is now a two-time Sidney Award winner. Bottari spearheaded CMD’s work on the Wall Street meltdown and subsequent attacks by ALEC politicians on wages and working families, public education, paid sick days and more. Q: Why is the Janus case so important, not only for the union movement, but for progressive politics in the United States? A: The forces behind the wholesale assault on public workers including the American Legislative Exchange Council, the State Policy Network, the Kochs’ Americans for Prosperity Group are well aware that unions are the most significant force in the United States battling for higher wages and better working conditions. They know that unions are not just fighting for themselves, but they fight to raise the minimum wage for all of us, preserve health care for all of us, strive to limit class sizes or improve public services and protect Social Security for all of us. As sociologist Theda Skocpol says in my piece “This form of ultra-conservatism is geared toward making sure that there is no organized power outside of big business and wealthy, organized donors” on the political playing field. If the Supreme Court overturns 40 years of precedent to facilitate this big money assault on unions, it will radically transform American political landscape, lead to worsening public sector jobs and the erosion of critical public services. For that reason, pulling back the curtain on how this machine operates and is funded is vital. Q: The anti-union coalition came up with a sophisticated strategy to push “right to work” legislation in red states and cases like Janus and Friedrichs in blue ones. Can you expand on how that effort works? A: The ALEC library of bills has a few dozen measures to dismantle unions and they are always adding more. They like to talk about “forced unionization” and say they are for “worker freedom,” but this is complete bunk. You can’t be for workers and be against the minimum wage, the prevailing wage or living wage ordinances — three other ALEC bills. A favorite weapon of these groups is ALEC’s misnamed “right to work” bill (RTW) which creates a free rider problem that weakens unions over time. In red states, they have pushed through RTW using the exact same game plan — ALEC politicians backed by “expert” testimony by State Policy Network groups and Koch ad buys and astroturf. This small group of extremists has been successful in passing bills over mass protest. Here in Wisconsin, we had 400 construction firms saying ‘no’ to a verbatim ALEC RTW bill, but their concerns were totally ignored. In blue states where Democrats have the power to block such legislation, State Policy Network groups and legal teams like the National Right to Work Foundation are always out there trolling for clients. Mark Janus who brought the Janus v. AFSCME case before the U.S. Supreme Court didn’t even have an original action against AFSCME. He was slipped into a lawsuit started by Illinois Governor Bruce Rauner. He makes for a much more sympathetic face for the attack on workers rights than a billionaire venture capitalist. And I don’t think this is the end, it’s really a new beginning. These groups will now accelerate attacks on unions, including by hiring hundreds of canvassers to go door to door in key states to talk members into dropping their unions. Q: Take us inside your process for unravelling the connections between the various billionaires and non-profits within the Janus coalition? What kinds of techniques and resources did you use to get this story? We track these groups quite closely - their financial filings, publications, speeches, videos, Twitter chatter and the like and sometimes we get lucky and find material that really details the way they talk about issues behind the scenes. When the Bradley Foundation was hacked by sophisticated international hackers, very few noticed. But our wonderful research team took note and we spent months working on a series of articles about Bradley’s weaponized philanthropy. Q: Teachers’ strikes are in the news right now. How do the anti-unionism and school privatization agendas fit together? A: These two agendas are inextricably joined. It’s no accident that most of these cases have been against teachers unions. Among the big funders of the anti-union groups bringing these cases, is the Bradley Foundation and the Walton Foundation. Both of these institutions are best known for their efforts to privatize the American school system. “Teachers unions are at the heart of all this,” says Skocpol in my piece because they are educated and they care about public schools in small and large communities across the nation. Teachers and parents are the organized opposition to the school privatization agenda, which siphons taxpayer money from public schools to advance school vouchers for private and religious schools. Data from multiple states is now showing these voucher schools are really harming kids. If you “neutralize” teachers unions (as the Bradley Foundation puts it), you get rid of the most significant organized opposition to school privatization. .
Q: Why do you think that the campaign against unions has been so successful, even as unions themselves are becoming more popular? A: When Republicans control so many state legislatures and governors’ mansions and they are all taking their cues from the ALEC-Koch playbook, that is a very uneven playing field. Even with robust push back against the agenda — as there was in Wisconsin by building contractors who were battling union busting and lower wages in the building trades — in the end, the politicians did what they wanted. Q: Most labor insiders believe that the Supreme Court is going to rule in favor of Janus and against public sector unions. If so, what’s labor’s next move going to be? A: I watched in amazement the huge, organized and peaceful protests by the West Virginia teachers. Public support for these workers and by extension for public schools and public services in the state was astounding. But the strikers won their full list of demands by thinking big and acting boldly — they shut down every public school in the state. If the U.S. Supreme Court rules in favor of the anti-union groups overturning 40 years of precedent and thousands of contracts for millions of workers, we are likely to see a lot more West Virginias.